After you partner has “popped” the question to you – wedding mode comes into effect. For most, it seems like a million things are running through your head. How are you going to plan, what you’re going to wear, who is going to be in your wedding party? Seems like your partner had the “easy” task, right? Well – maybe not. Proposals seem to have become more elaborate and it’s no surprise that asking your loved ones to be in your wedding has followed that trend. Now that you’ve got the ring on your finger, it’s your time to propose to your bridesmaids! Your bridesmaids are usually the ones who have been with you through thick and thin, highs and lows, break ups and makeups. 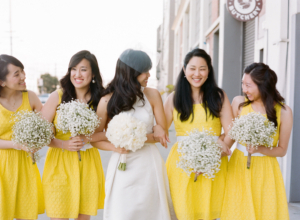 Your bridesmaid will play a crucial part in your wedding planning. It’s now time for you make it official – with your bridesmaids by your side. 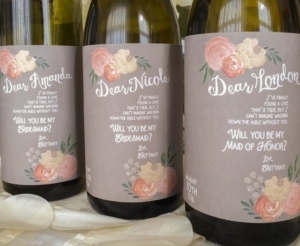 We’ve rounded up some genius ways to propose to your bridesmaids – and it’s something to remember! Make it personal. Buy their favorite wine and decorate the bottle with a message. This will be sure to win them over! You can even grab some cheese and crackers and make a girl’s night out of it – How could you say no to wine and cheese? Oh, and of course being a bridesmaid. Just remember, you don’t have to spend a ton of money on something like this, but it is fun to make it personal, and memorable for everyone involved. Consider a DIY project like a handmade card! If you’re someone who is skilled at 1. Baking and 2. Steady decoration work, then this next idea is for you! 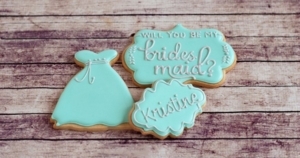 (For me, that is not the case) – Bridal related cookies for your bridesmaid/maid of honor. As I just mentioned, I am not a great baker and certainly do not have skills to decorate cookies like this – and if you’re in the same boat as me, go to your local bakery. Chances are, they will take on this project for you. This is a sweet way to win over your proposal, literally. 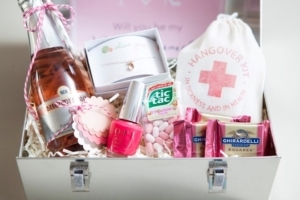 If you want to leave a big impression on your bridesmaid proposal – create a box filled with goodies and treats! Have the box say “will you be my bridesmaid” right on the top inside so it’s the first thing that grabs the attention. This is even a great idea for the groomsmen. Now, it may not be filled with Bubby wine or pink nail polish, but you really can’t go wrong with items that your bridal party loves. You may even want to consider personalizing each box for each person. 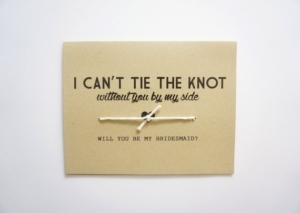 For more ideas on how to propose to your bridesmaids visit our Pinterest Page: The Bridal Garden.